Awrey Bakeries, LLC is one of the largest baked goods companies in the United States. The company is privately-owned and produces a variety of baked goods for a diverse range of customers. Awrey Bakeries, LLC was created in 1910 by the Awrey family. Originally from Canada, the family emigrated to Detroit in the US, and became quite popular for baking great-tasting baked goods. In the succeeding years, Fletcher & Elizabeth Awrey decided to open several stores in the neighborhood selling the different baked goods that they created. The stores immediately became popular in the neighborhood as many of the residents already knew of the great quality baked goods that the Awry’s made. Today, after over a hundred years, Awry Bakeries still continue to develop new products and improve existing ones, in order to provide customers with great-quality and great-tasting baked goods. The company is still committed to refining its operating procedures and takes pride in the food safety and quality of its products. Despite the company’s products being mass-produced, the company makes sure that every recipe is made from scratch, baked, and then fresh-frozen. Every recipe that the company introduces to the public is sure to contribute to maintaining Awrey Bakeries’ reputation. Awrey Bakeries has always been known for great appearance and a great homemade taste. 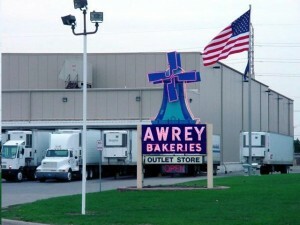 Awrey Bakeries, LLC produces and supplies a wide variety of baked goods to different foodservice operators, retail food stores, and even the US military. The company also sells its products in in-store bakeries. It also accepts orders for contract baking. For contract baking, the company offers frozen and industrial components, as well as co-packing. As for supplying for the US military, Awrey Bakeries has a wide range of baked goods that are part of theNAPAtroop feeding program. The company’s products are coded, or named E09 and E59 as part of the military’s “Subsistence Prime Vendor Program”. Some of the baked goods that the company produces include cheesecakes, layer cakes (gourmet), specialty desserts (gourmet), biscuits, rolls, brownies, croissants, English muffins, Danish pastries, and donuts. With creative and colourful packaging, many consumers find themselves impulse buying the different baked goods that Awrey Bakeries produce. These baked goods also offer consumer convenience, as most of these baked goods only require thawing before serving, thus less hassle in the preparation. Do you ship? Can I order the date nut bars online? Could someone tell me, what grocery stores sell these products? The outlet store is out of my driving area. Kroger has some Awrey products. The problem is they are not always packaged under the Awrey brand. For years I worked at Awrey’s and it’s easy for me to spot their products. I’m not sure that it would be as easy for someone that wasn’t familiar with their baked goods. Does Awrey’s still make date filled cookies that I enjoyed many many years ago? If so, can they be purchased on-line? Thank you. What stores in my area sells Awrey’s danishes? My zip code is 19111. Can I get a email back?